To confirm, at 1:30 today, that this should be going ahead as planned. RIM is almost aboard her train, as I type. 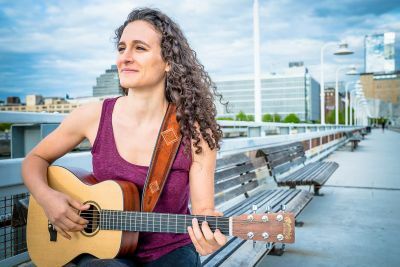 Yet another artiste new to the Focsle Music audience, “New American folk” singer-songwriter ROBIN IRENE MOSS, accompanies her blend of emotion, intelligence and poetry on guitar. Currently based in New York, she’s over this side on a wide-ranging tour, ping-ponging across all parts of Britain as well as several Continental breaks before the late autumn. Plenty of full-length song-clips on her website. Format matching usual guest nights at The Guide Dog: a round or two of performances from any musically-inclined audience, then a couple of supporting spots, followed by the main act. Pass-the-Hat collection for our guest (recommended donation: £5+; some of her ticket-only gigs are already sold out, so we consider ourselves lucky to secure her on a generous pay-as-you-feel basis). Also, our raffle (participation optional) with, as minimum, a confectionery or alcohol prize.